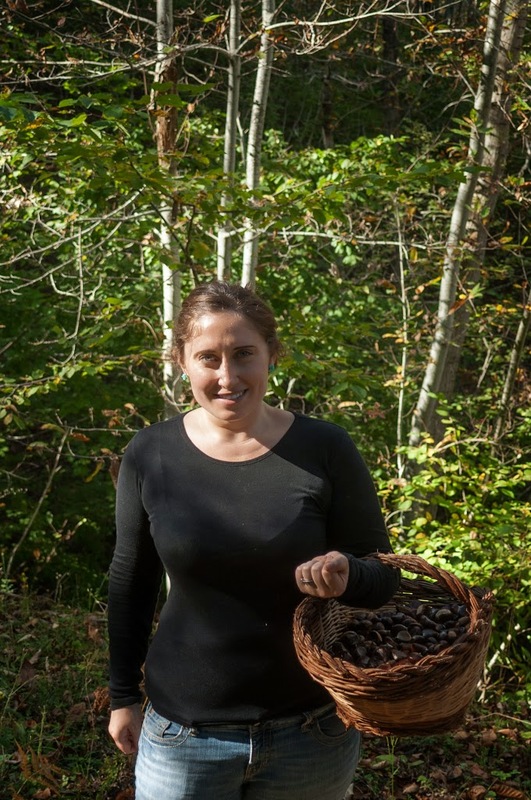 Daniele’s family gathers chestnuts every fall to enjoy in winter. 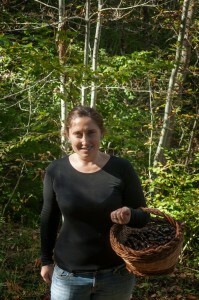 They go to a forest-like park where they know chestnut trees grow and gather garbage bags worth of them. This fall Daniele, his father Giulio, and I went to gather them. There has been an infection on the chestnut trees in Italy with a bug from Asia. 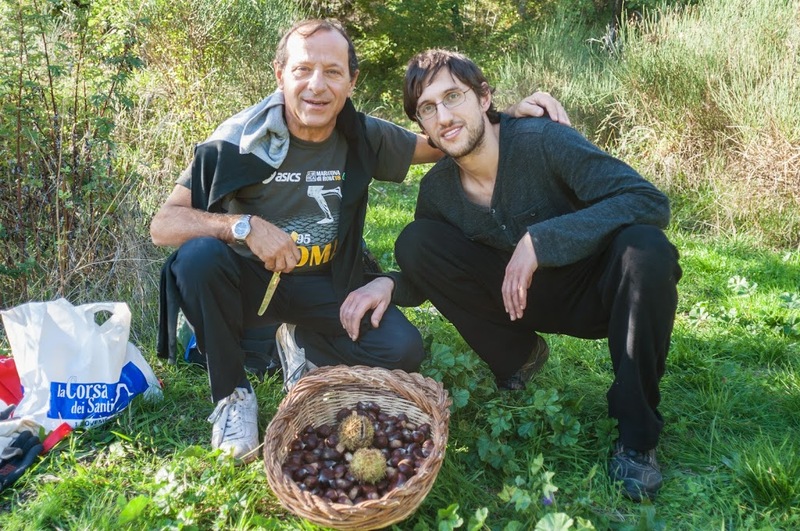 Some of Giulio’s friends failed to find any chestnuts at all, but Guilio knows all the places and brought us to a place where there were less than past years, but still as many as we could want to gather up off the floor. 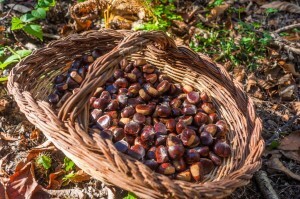 I had never gathered chestnuts before, so I didn’t know how it was done. We used a basket to throw them in as we went and several backpacks to transfer our hoard to when the basket gets full. The chestnuts themselves grow in little clusters, that remind me of garlic, the way they are shaped and grouped. The clusters are enclosed in a spiny shell, that is already opened and we toss aside wearing gloves. 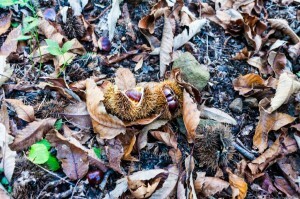 The chestnuts covered the ground like a blanket, and the sound or more falling punctuated the quiet forest. But there are rules to which ones you take. Most obviously, you toss any with little holes in them; that means there are worms inside. It is hard to see these little holes and we had to toss many after we got home and could see them better. Once or twice we missed the worm hole and ended up with little toasty grubs alongside our chestnuts. Good news is you would never accidentally eat one of these worms. If he didn’t run out of his roasting nut-house in the oven, you would see him when you broke the nut open to eat. The second rule is you should go down into the forest farther to gather the bigger nuts. Giulio says the bigger nuts are heavier and end up collecting farther down. Daniele and I were so mesmerized picking up all the chestnuts on our way down, that we never made it as far down as him. And, in fact, Giulio had much nicer, bigger, chestnuts at the end of the day. What do we do with all of these chestnuts? The classic way to eat them is roasted in the oven after a meal– especially on a cold night. You cut a slit into the heard but meaty chestnut, then put it in the oven at 180 Celsius for maybe 20 minutes. They become a little darker, and soft or a little wilted looking. And then you make conversation while casually ripping them open and popping them in your mouth. 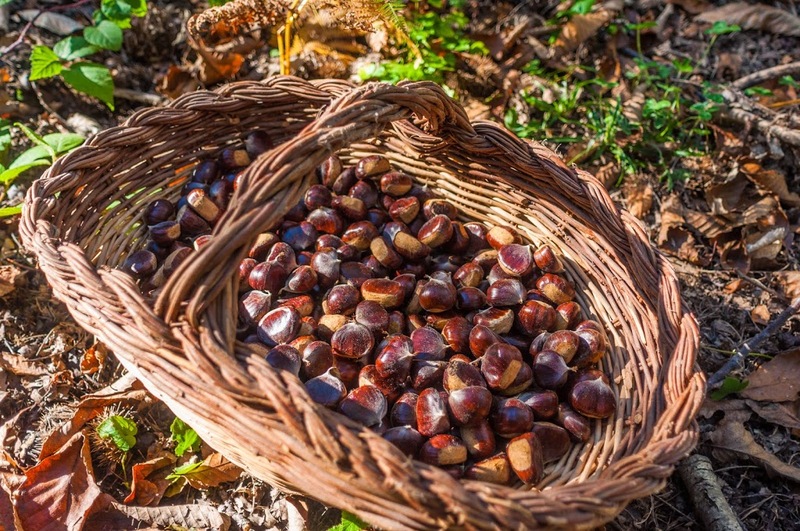 You may only drink wine (red, normally) with your chestnuts, because water will swell your stomach. Chestnuts behave a bit like bread or rice in this way. In fact, chestnut flour is very common here in Italy. We had so many, we looked up other things to do with them. Daniele made a delicious soup with chestnuts and porcini mushrooms. It was too much work to do often though. He had to roast the nuts, peal them, blend them, then make the rest of the soup. Daniele’s mother says you can’t freeze them and have them still be good, but maybe it could work if you cook them first then freeze them after. We didn’t try it, because we were ready for a break from chestnuts when the end of the “season” arrived. I’m looking forward to next year’s though! I simply want to tell you that I am just very new to blogs and truly liked you’re web page. Probably I’m planning to bookmark your blog . You actually come with fabulous stories. With thanks for sharing your blog site. Hello, I do believe your site may be having browser compatibility problems. When I look at your website in Safari, it looks fine however, when opening in Internet Explorer, it’s got some overlapping issues. I just wanted to provide you with a quick heads up! Besides that, great site! I just intend to share it with you the fact that I’m really novice to writing a blog and absolutely enjoyed your work. Very likely I am most likely to store your article post . You undoubtedly have fantastic article text. Love it for share-out with us your domain write-up. Highly significant highlights that you have said, thanks so much for posting. We just desire to show you in which I’m really fresh to having a blog and totally enjoyed your post. Most likely I am going to bookmark your site post . You definitely have lovely article subject. Love it for discussing with us your url document. Excellent goods from you, man. I’ve understand your stuff previous to and you are just too wonderful. I really like what you have acquired here, certainly like what you’re stating and the way in which you say it. You make it entertaining and you still take care of to keep it wise. I can not wait to read far more from you. This is actually a tremendous site. We simply want to inform you that I am beginner to blogging and very much enjoyed your work. Likely I am prone to store your webpage post . You definitely have memorable article content. Be Thankful For it for telling with us your website information.